Variable tooth pitch (Unequal Pitch) is an original design that changes the tooth space, tooth height and gullet for each cutting tooth and that also changes the set pattern. It largely reduces inherent vibration and chatter of the blade by controlling the factors. 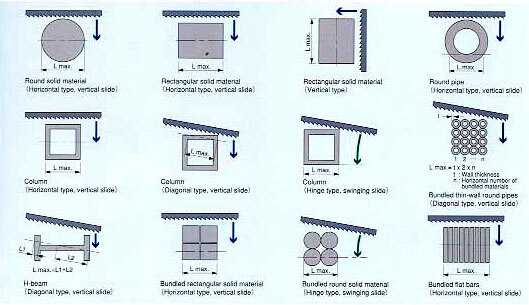 Particularly when cutting structural steel and tube materials. It exhibits quietness of 10 to 30dB less than a regular tooth pitch blade. Also, as the cut in value is effectively dispersd among teeth, smooth cutting of high efficiently is assured. 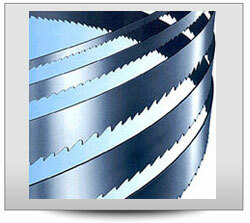 The tooth tips of a blade are required to be hard and the backing to be ductile. These antithetic conditions were cleared by bi - metal blade produce by using special electron beam welding. 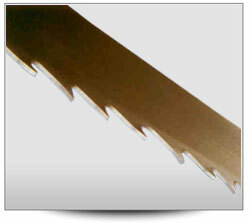 A blade that is composed of two types of material, that is the highest grade high speed steel for teeth and tough special spring steel for the backing, exhibits the performance that is of no comparision with conventional quench hardened blades high speed, high accuracy and long service life. It can handle hard to cut materials of a wide range, it is stron against bending and torsion, and it makes possible large reduction in the cutting cost. 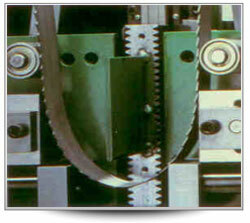 The maximum cutting lenght (L max) varies also depending on the type of the bandsaw.